I'm back from Malaysia! And having tried cow pat tarts for real, I knew that they were the first thing I'd have to make when I got back. You may remember that I've attempted to make these custard-filled cakes before, having heard about them from my mum but not previously tried them. They were good, but the cake base was too thick and dense, and I didn't make enough custard. This time, I made a light and airy 'fatless sponge' instead of a butter sponge, and dropped the batter straight onto a lined baking sheet to make flatter 'sponge drops'. I also only blasted the meringued tops for a few moments under the grill rather than double-baking it. The results: a light, airy bite with a marshmallowy topping and a creamy custard centre. This time, I just stuck to the 'cow dung pile' style of shape (last time I made cow dung piles and UFOs). I made one tiny mistake- although it turned out to be an awesome one. I forgot that fatless sponge batter inflates and expands when baked, resulting in giant cow pat tarts. Like I said, a mistake, but an awesome mistake. 1) Make the sponge drops first. Preheat the oven to 180 degrees C, and line and grease a couple of baking sheets (you may need to make in batches- I made ten giant ones, but intended to make twelve). 2) Whisk the egg whites until they form stiff white peaks, and set side, In another bowl, whip up the egg yolks and sugar until pale and fluffy. Fold the flour and salt into the yolks, then carefully fold the egg whites in to make a thick, fluffy cake batter. 3) Drop spoonfuls of the mixture onto your baking sheets, smoothing them out a tiny bit into circles (but not flattening them as they spread out themselves in the oven). Make sure you leave a couple of inches between them to expand. 4) Bake in the oven for about ten minutes or until golden brown- they won't need much time because of their size- and leave to cool completely. 5) Next, make the custard. Lightly whisk the egg yolks, custard powder, vanilla and milks in a microwavable bowl, and microwave in short 20-30 seconds bursts until the custard is very thick, but not thick enough to be piped (it'll thicken up to a scoopable consistency as it cools). Place some clingfilm on the surface of the custard to stop a skin from forming, and leave to cool. 6) Now, make the meringue topping. Whip up the egg whites until they form stiff peaks, add in the cornflour and whisk in the sugar until glossy. Done! 7) Finally, assemble and brown your cow pat tarts. Preheat your grill to a medium to hot heat (about 180 degrees C). 8) Evenly distribute the custard between the bases, spooning a generous dollop into the centre of each. Now pipe the meringue in cute little poo shapes (never thought I'd ever type a sentence like that) onto the tarts, completely covering the custard. 9) Place under the grill for a few minutes and WATCH LIKE A HAWK or your tarts will burn. Take your cow dung piles out when they're nice and caramelised. 10) Cool, because cooked sugar is all burny and stuff, and enjoy! As you can see, I was a little amused at how large the sponge bases became when I fished them out of the oven. See what I mean? Still, I can't complain: more cake is never a bad thing, and it made them the perfect size for dessert! 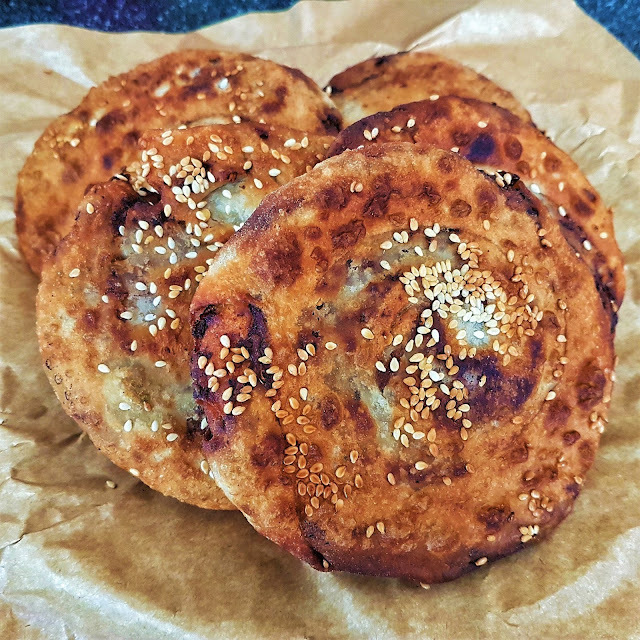 These are even better than my previous recipe, though I did miss the butter in the sponge- and the authentic ones I ate in Sabah did taste buttery. The third time I try making these, they'll be perfect.